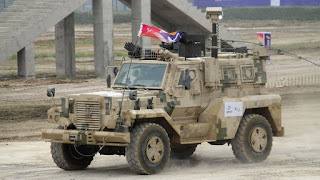 China North Industries Corporation (NORINCO) has produced new variants of its 4x4 VP11 lightweight mine-resistant ambush-protected (MRAP) vehicle with armoured personnel carrier (APC) and internal security (IS) models rolling out of a recent production run, Jane’s can confirm. In the APC role the VP11 can carry seven dismounts plus the driver who can rapidly enter and leave via three doors – one in each side and one in the rear. For increased crew survivability the VP11 is equipped with bullet/splinterproof windows with those in the sides fitted with a circular firing port. Ballistic protection is to STANAG 4569 Level 1, which protects the vehicle from 7.62 mm ball rounds but this is upgradable to Level 2. The VP11 has a V-shaped hull, which provides a higher level of protection against mines and improvised explosive devices (IEDs), with the wheels located outside of it so that they are ejected away from the vehicle in the advent of a mine or IED blast. Trials have shown that the VP11’s hull is capable of withstanding the blast generated by a10 kg TNT explosive under the wheels or an 8 kg explosive under the hull. NORINCO has confirmed that in addition to being fitted with a protected weapon station (PWS) armed with 7.62 mm or 12.7 mm machine gun (MG), the VP11 can also be fitted with their UW1 remote weapon station (RWS). The UW1 RWS can be armed with a stabilised 7.62 mm or 12.7 mm MG or a 30 mm automatic grenade launcher (AGL) with a day/night sighting system mounted externally on the right. For use in the internal security role the VP11 has been observed fitted with the NORINCO CS/LW2 38 mm vehicle-mounted nine shot anti-riot launcher. This is normally mounted on the roof and has electric traverse through 360° and elevation from 0 to 40° with power supplied by the vehicle’s 12 or 24 V electrical system.